been in the reactor for a full three fuel cycles. This is the LWR plutonium over which arguments have raged concerning its usability for weapons. Such fuel indeed has a high content of isotopes other than the most desirable plutonium-239. been separated in reprocessing plants is more-or-less of this composition, too. The amount of plutonium produced would be about 2 kilograms per ton of uranium, or about 150 kilograms per 8 month cycle.39 This comes to about 30 bombs’worth. Does a would-be nuclear weapon state need more? If the short refueling cycles were continued the annual output of weapons-grade plutonium would be about 200 kilograms (allowing for refueling time), but this would require a large amount of fresh fuel. Such a progression involves a considerable departure from commercial operation and for an NPT member would signal Treaty violation. 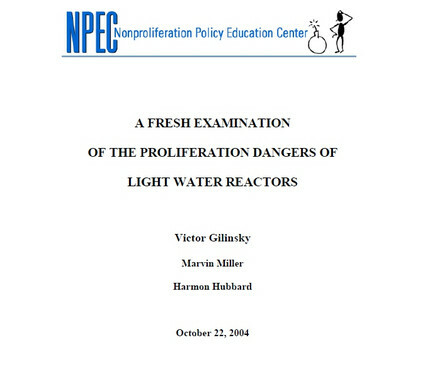 Still, it illustrates what a standard LWR can do when viewed as a plutonium production reactor.